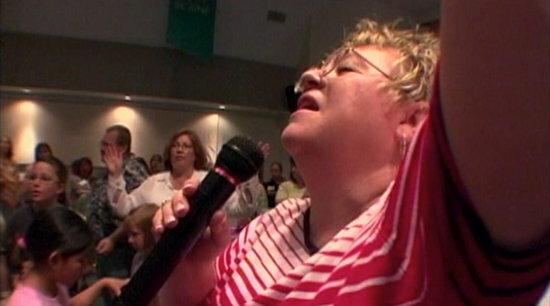 Watching Heidi Ewing and Rachel Grady’s 2006 documentary, “Jesus Camp,” about the indoctrination of Evangelical Christian children to serve as soldiers in the army of God, I was at first amazed that the filmmakers had been able to gain such intimate access to the children, their parents, and their religious instructors, given the filmmakers’ more liberal viewpoints. Then I realized that what a non-Evangelical Christian might see as something close to brainwashing is viewed by Evangelicals as effective religious training, an appropriate response to Islamic fundamentalist terrorist training. The film focuses on Becky Fischer, a children’s pastor who runs Kids on Fire, a summer camp for Pentacostal Evangelical Christians, ironically located at Devil’s Lake, North Dakota. She is very, very good at what she does, training children 12 and under to be soldiers of the Lord. And she is very proud of, and open about, the methods she uses. A growing percentage of the US population describes themselves as Evangelical, or born-again, Christians, and their political influence in expanding along with their numbers. George W. Bush, who was president at the time this film was made, a born-again Christian himself, had a tremendous influence. As the film opens, Bush has just nominated Samuel A. Alito, Jr. to replace Sandra Day O’Connor on the Supreme Court. The evangelicals know that Alito would change the balance of the court, making it possible to repeal Roe v. Wade and pray for his confirmation. 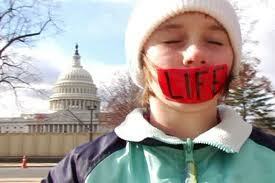 (The issue of abortion taken up in “12th & Delaware,” a 2010 film by Ewing and Grady, also being screened at the Woods Hole Film Festival). Representing the responses of non-evangelical Christians is radio talk show host Mike Papantonio, who feels that the Christian Right is dividing the country, that church and state must remain separate. “Nothing Christian about them,” agrees one of his callers. “None of it really makes any sense,” laments Papantonio, decrying the entanglement of politics with religion. He remains frustrated and perplexed throughout the film, while Fischer moves ahead, telling her young and eager students that they hold the key, they can change “this sick old world” by proselytizing and speaking out on behalf of fetuses in danger of being aborted. Becky is asking a little more of these kids than distributing pamphlets door to door. She wants them to participate in anti-abortion rallies and be willing to lay down their lives for the Gospel, “just as they are in Pakistan, Israel, and Palestine.” The children use military language and dance with spears and in camouflage to illustrate their roles as warriors of God. Children participate in an anti-abortion rally. The film follows Levi, 12, Rachel, 9, and Tori, 10, three young believers. Levi, who was born-again when he was only 5, has already begun preaching himself. He, like many others, is home-schooled and learns from his born-again mother that evolution and global warming are just plain wrong, and that creationism is correct because it is “the only possible answer to all the questions,” reasoning that pleases Levi. Rachel is a bright young girl who would like to be “one of those people who paint nails” so she can spread the word about the Lord to her customers in a peaceful setting, with Christian rock music playing in the background. She has the missionary zeal, is moved to tears in charismatic moments, and puts herself in a trance by speaking in tongues. Tori loves to dance, though she admits she sometimes mixes up “dancing for the flesh” and “dancing for Christ.” She and her family pledge allegiance to the Christian flag and the Bible. Once at camp, the leaders pray over the seats, the electrical system, the PowerPoint program, and the video projectors and microphones to be sure nothing interferes with conveying the camp message. Becky remains a strong and resourceful pastor and caring mother figure throughout, firm in her commitment to the Lord herself, and certain that the world can be changed by winning over the children. A former DJ on a country music station, she knows how to handle a crowd. She shows anger only once, in her attack on Harry Potter as a warlock, an enemy of God. 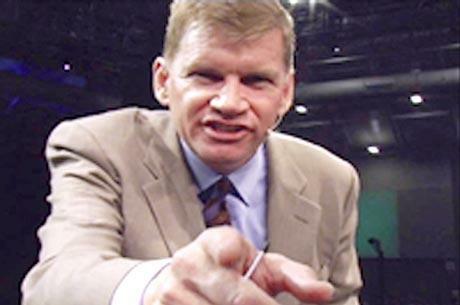 We also visit the New Life Church in Colorado Springs, which, at the time was headed by Pastor Ted Haggard, whose homosexual relationships and drug use forced his resignation from the church shortly afterward. In the commentary to the film, Ewing and Grady talk about their desire to revisit these kids 10 years later and see how they are doing. I hope they do. “Jesus Camp” was screened tonight at 9 PM and “12th & Delaware” will be shown Tuesday, August 2, at 7 PM, at the Old Woods Hole Fire Station. “12th & Delaware” refers to an intersection in Fort Pierce, Florida, where an abortion clinic and a pro-life crisis pregnancy center stand across the street from each other. As in “Jesus Camp,” the directors allow the film’s participants to tell their own stories. And stay tuned for Ewing and Grady’s upcoming film, “Detroit Hustles Harder,” a look at the city’s struggle to transform itself into a new and innovative place.